Fifteen years ago, my father, stepmother, brother, sister, and I packed ourselves in three vehicles, stuffed all our belongings in a small trailer, and came to Canada in search of a better life. This was before September 11th, and immigrating to Canada was much simpler back then. There was a score system for evaluating your potential as an immigrant, and we scored highly. We were immigrating as a family, my father had a PhD and my stepmother had a Bachelor’s, we all spoke one official language fluently, were in excellent health, and were highly employable. Once we filled out the paperwork, completed thorough medical evaluations, and had records and references checked, we were able to move to Canada as landed immigrants in less than a year. We had been living in the US as students for the previous four years, and after four years away from Brazil, it was clear to us that we could not return to a country where we had no future. Violence was rising, employment was scarce, and our family didn’t have any prospects for being economically stable if we returned. My stepmother and father had been enamored with Canada for a long time, so they looked into immigrating here, we filled out the paperwork, and the rest, as they say, is history. My family and I were some of the lucky ones. We did not have to leave behind all our belongings, or run the risk of losing loved ones en route. We had a choice to immigrate, rather than being bullied into doing so by militants who have no concern for the lives of the innocent. Our immigration story was a happy one. Shortly after arriving in Canada, my brother and I joined the Naval Reserves, my brother serving for twelve years, me serving for seven. We joined as one of the ways to show our commitment to our new country, and I would be lying if I didn’t say that part of the reason I joined was because I was thankful for the amazing welcome I received in my new country. I was proud to parade on Remembrance Day, thanking those who came before me, so that I could be free. I was a cenotaph guard for one of the ceremonies, and the pain and numbness in my toes were easy to ignore when I remembered what I was honouring. A country that believes so much in freedom, its citizens are willing to die to defend it. I am a proud Canadian. I also happen to be a Brazilian, too. A Brazilian immigrant. I’ve accomplished many things since being welcomed into Canada. I obtained a dual Bachelor’s degree as well as a professional degree, all while working two jobs to be able to survive financially, because an immigrant’s life, at least initially, is not an easy one. I’ve worked several different jobs, all of which gave me raving reviews when it was time for me to move on. In one of those jobs, I helped people plagued with pain from chronic health conditions to improve their health, so they needed their mobility devices less frequently. I’ve already mentioned my military service, and finishing basic training is something I’ll forever be proud of. I’ve had my own companies, I’ve written articles and given interviews that inspire others to try their best, improve their health, and follow their dreams. I created a fundraiser to help those in my city who don’t have enough to eat. I frequently donate care packages to the homeless, and I donate what I can to help people, both in Canada and abroad, to live better lives. I’m raising three wonderful children to the best of my abilities; children who I hope will one day contribute to our wonderful society their skills, their love, and their acceptance of all humans, no matter where they come from, or to what religion they belong. I learn every day, and I accomplish something every day. I’m not listing all these accomplishments to toot my own horn. I’m listing all these accomplishments to show you what an immigrant is capable of attaining, when she is welcomed with open arms. I have been in Canada for fifteen years, and I can honestly say that I have never in my entire time here, felt discriminated against because I am an immigrant, or because I am brown. There was one instance that might be considered somewhat prejudiced, but I chalked that up to ignorance and carelessness. All in all, I’ve been accepted, welcomed, and even praised for immigrating here and accomplishing the things I have accomplished thus far. But I’m an extrovert who loves to be around people, and I easily fit in anywhere I go. I’ve never found new experiences to be intimidating; I am an adventurer who thrives in the unknown. My English is excellent, and my accent is minor. I’m a Christian. In other words, unless your prejudice and racism are blatant, it’s fairly easy for me to escape unscathed from it. The Syrian families seeking refuge aren’t as lucky as my family was. They are trying to escape unspeakable acts of violence, by people who don’t care that they have families to raise and lives to live. They are trying to escape from the same people whom you fear. They are so afraid, they are leaving all their belongings behind, and risking their lives to find a way to save their families—all while running the risk of losing loved ones, so they can simply live. To my friends and acquaintances posting anti-immigrant sentiments on Facebook, I ask you this: why are you my friend? Why do you think it was OK for me to join this country, but it’s not OK for the Syrian families fleeing violence to do so? Or are you my friend despite the fact that I immigrated here, and apparently took away born-citizens’ jobs and places in society? When you post anti-immigrant sentiments on Facebook, you are indirectly telling me that I don’t belong. That you’d rather I not be here. That I should pack up my bags and leave. And that hurts. It hurts to know that you don’t think I have the right to be here, even though I’m just as Canadian as you are—the fact that I earned my citizenship through hard work and pride doesn’t matter to you, because I wasn’t born here. And if I wasn’t born here, I don’t deserve to earn my citizenship through the aforementioned endeavours. 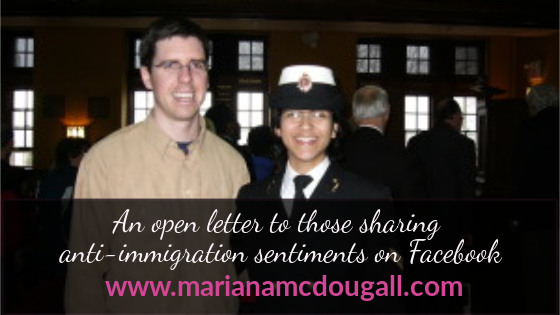 Whenever you post anti-immigrant sentiments on Facebook, you are telling me that I’m not a real Canadian. That I shouldn’t have come here in the first place. But your obvious hatred towards me and my being in Canada isn’t all that’s wrong with anti-immigration issues. There is also something else that no anti-immigration person on Facebook seems to realize, and that’s the obvious fallacy of their sentiment. Unless you are a first nations person, your being in Canada was only possible because of immigration. Anyone who is not a member of an indigenous people is an immigrant. Your being here was only possible through the displacement, exploitation, and deaths of thousands of indigenous people. If you feel so strongly about “closing our borders,” as this thoughtless meme suggests, then please, kindly pack your bags and go back to whatever country your ancestors came from. If, after reading all this, you are still anti-immigration, please, de-friend me on Facebook, and burn my contact information, no explanation required. Because obviously, you don’t think I’m worthy of your friendship, unless I leave the country. And that’s just not going to happen. I’m a proud Canadian, and where I was born has nothing to do with it. Previous Previous post: Transform your dream into a goal… and achieve it. Next Next post: New Year’s Resolutions? Here’s how to actually make them happen. Bravo, Mariana! Heartfelt and full of truth – an excellent piece. This is a well written article on what immigrants can do and why blocking all of them is such a bad idea. Thank you for reading; if you enjoyed, please share. Reading your article actually made my heart SWELL. Beautifully written! I will undoubtedly be sharing this with all my friends and acquaintances. You declare yourself as a proud Canadian so well; your defination of what it means to be Canadian, a citizen of the world, and global humanity, speaks volumes! Thank you for thoughts. The world needs more of this. HUGS!! Aww Linda; your comment made my heart swell. Thank you so much for all your support.